The recipe for this sambar is different from what we usually prepare.I call it podi(powder) sambar as we have to use podi (masala powder) for this.This masala is made out of Dhaniya,Jeera,Redchillies,etc..this actually adds taste and flavour to the sambar.This sambar goes good with Dosai,Idly,Vadai as well Pongal. 1.First pressure cook Moong dhal & Thoor dhal together&keep aside. 2.In a pan add oil and then add mustard. 3.Now add chopped onion and chopped tomatoes. 4.Fry them for some minutes.Now,add the tamarind juice. 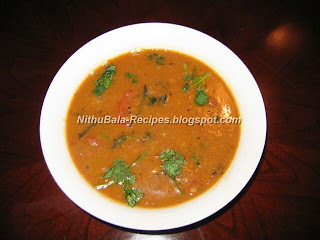 5.Add sambar thool and salt. Mix well. 6.Allow it to boil well.Later add the cooked dhal. Mix well. 7.Cover the contents with a lid & keep it in stove for 10 minutes. 8.Now, add the masala and mix well.Keep the sambar in stove itself for 5 more minutes. 9.The sambar is ready now and garnish with coriander & curry leaves.